Reblogged this on Musings of a Solitary Witch. My Wife is pregnant and I would like to purchase a Malachite Waist Bead set. I was inquiring about the price? Greetings: Waistbeads are a wonderful gift for a pregnant woman! They surround your wife and unborn child with positive, loving protective energy and malachite is a wonderful crystal for that. 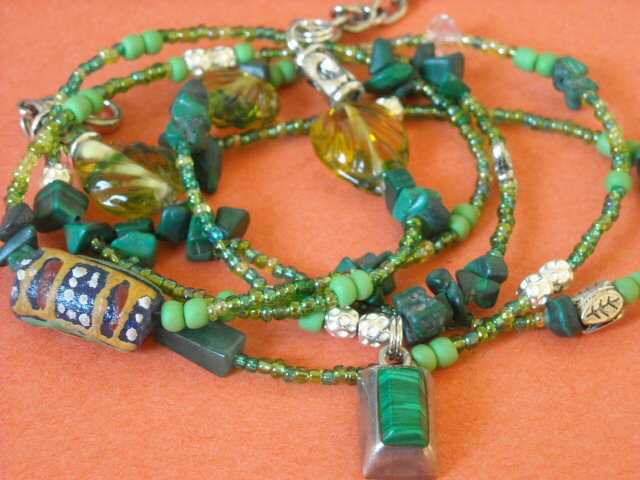 I can custom-make a malachite set for her for $30, plus $5.00 shipping fee for a total of $35.00. Please go to my store at http://www.etsy.com/shop/wrapandsoul. On the homepage, click “320 sales” on the left side menu. There you can see all of my previous creations. Browse through them and select a few charms or pendants that you like. I may not have them all in stock, but I will do my best, so give me a few options. When you are ready, click the “custom waistbeads” button on the site and let me know what you would like. Hi angy: All of my work can be found on etsy.com/shop/wrapandsoul. On that site you can also click “custom waistbeads” and indicate your exact measurements and ask any other questions. As of 2014, most of my waistbeads are $25USD. However, custom waistbeads are a few dollars more.